Cate Masters: Release day for Ground Rules! Release day for Ground Rules! I am super excited! Not only is today the day that The Wild Rose Press releases Ground Rules, my Christmas fantasy, but it's also the day that Margaret Atwood is holding a booksigning in Carlisle! If Mother Nature tries anything today, she'll have to answer to me, lol. Ms. Atwood's my literary hero, a goddess of speculative literary fiction. I'll be there with bells on, come hell or high water. 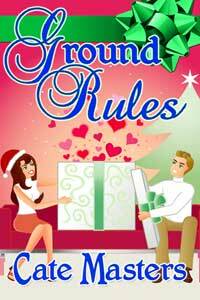 And oh yeah, I'm also excited that Ground Rules is here! It always feels like release day will never come. Wish the excitement could last as long as the anticipation! Cate, that's awesome! Crap, you should've let me known sooner - I would've done a big announcement for you on my blog. I'll plug it for you on Monday (I have a guest this Friday) is that all right? That would be wonderful! Thanks so much. Books on sale for Black Friday! Happy anniversary to Gary and me! November madness in full swing!